Yay! Today is the first day of spring! For some crafters, the shift in seasons dictates a shift in activities. Some knitters and crocheters put the yarn away until fall. Some beaders drop their needles and pick up their seed packets and gardening tools. I have an insatiable need to create that doesn’t just take a summer snooze. So I find that trying a new craft or new product helps alleviate the crafty doldrums that necessitate change. This spring, my newest obsession is ICE Resin. It all started when Ranger Industries sent me some goodies to consider for Beadwork magazine’s Cool Stuff department. 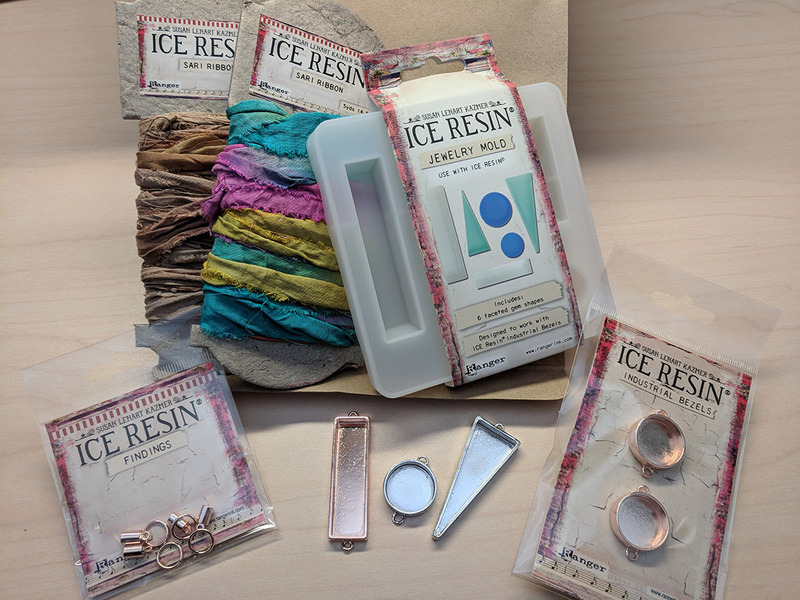 I opened the mystery box and found ICE Resin’s new industrial bezels, ICE Resin molds, sari silk ribbon and findings. I rifled around in my stash and found some ICE Resin and alcohol inks to play with. And then it was game on! Part of the treasure trove I discovered in the box from Ranger Industries. I’d seen some ideas for using botanicals in ICE Resin, so I headed outside with a baggie and some scissors. I snipped some samples from pine trees and juniper bushes around the office. I mixed up some ICE Resin, added some alcohol inks, and got to pouring. There were enough spots in the mold for me to try a few different techniques. I experimented with adding glitter, tried pouring two different ice resin colors together, and embedded my botanicals. 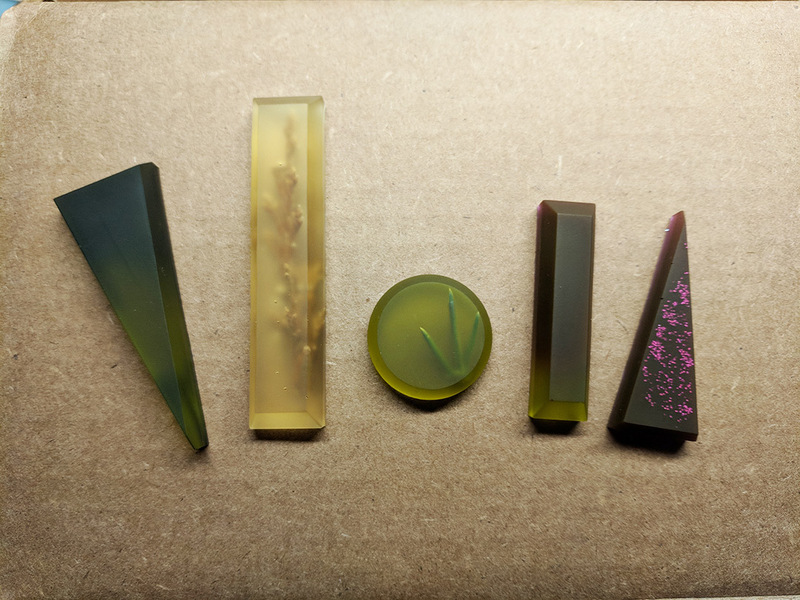 It was a lot of fun experimenting with different techniques in the ICE Resin jewelry mold. After everything was cured, I popped my creations out of the molds and was blown away by how cool they turned out. The matte finish from the silicone mold was an unexpected result and I love it! 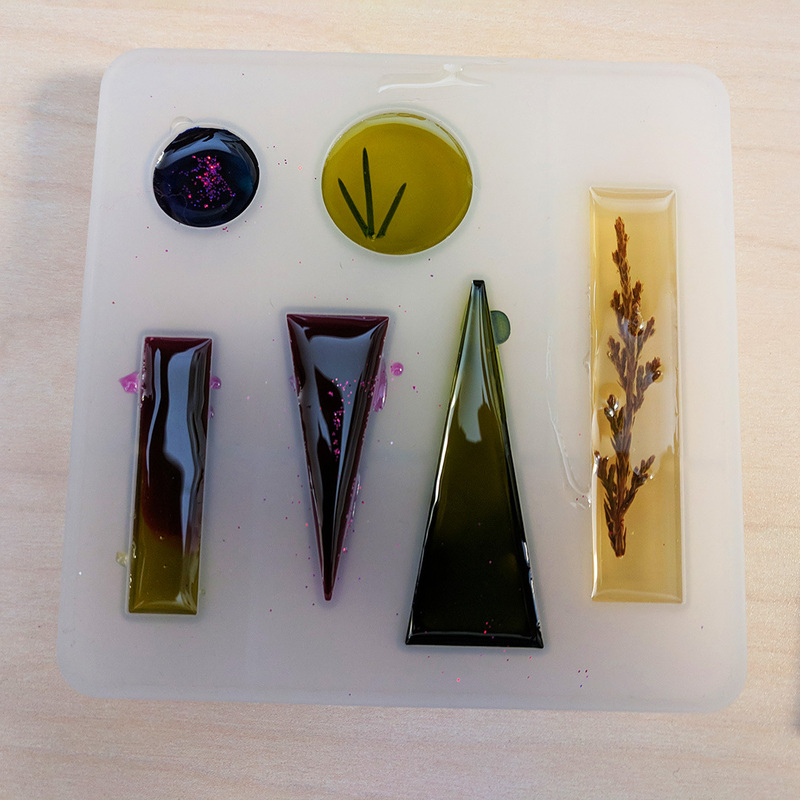 Turns out, shiny silicone molds make shiny pieces, and matte molds make matte pieces. It’s like magic. I have learned that if you use a matte mold and then want to make the piece shiny again, all you have to do is brush on a thin layer of ICE Resin on top and it becomes crystal clear again. I noticed some air bubbles in my pieces with botanicals. Katie Hacker shared that epoxy resin doesn’t like moisture, so botanicals should be dried before added to resin products. I asked Patti Behan, Ranger’s Education Manager, if she had any tips for using botanicals in ICE Resin. She suggested using ICE Resin’s Paper Sealer to lock the moisture in. To do this, you brush the sealer on and make sure the botanical is fully covered with an even coat and thoroughly dried before suspending it in ICE Resin. That way you can still get the vibrant colors and supple texture of a freshly-cut botanical without any negative effects! Exposing the resin to heat after pouring can help release any bubbles that got mixed into the resin. People use hair dryers, heat guns, torches, or even plain-old lighters. I’ll definitely be giving this a try for my next ICE Resin creations! The ICE Resin I had in storage had yellowed, which was not a problem for my pieces, as it still cures to the same hardness and only the color is affected. Patti said that you can slow down the yellowing by storing it in a cool, dry, dark place. Before you store the bottles, squeeze out the excess air until the bottle collapses a little bit. It’s a smart idea to only buy as much resin as you will use with six month time period, if you don’t want to work with yellowed resin! 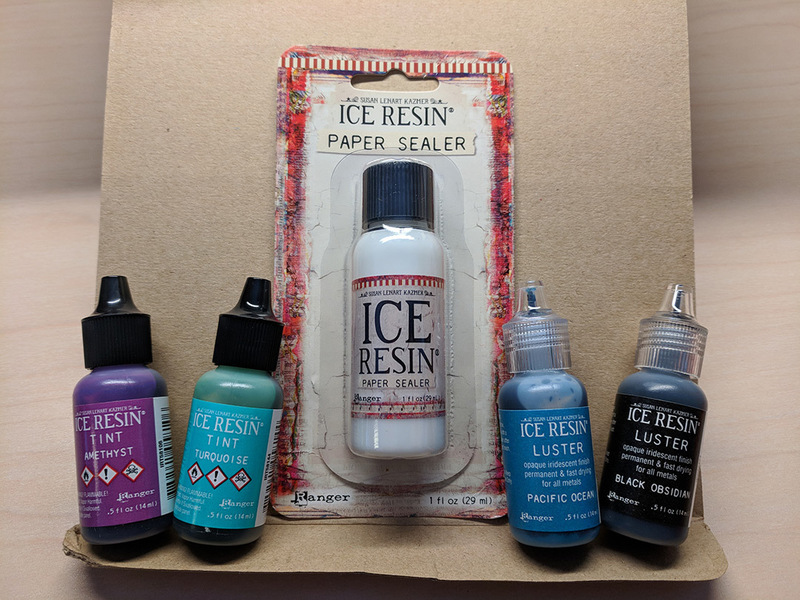 ICE Resin paper sealer, tints, and lusters are on my list to play with next. 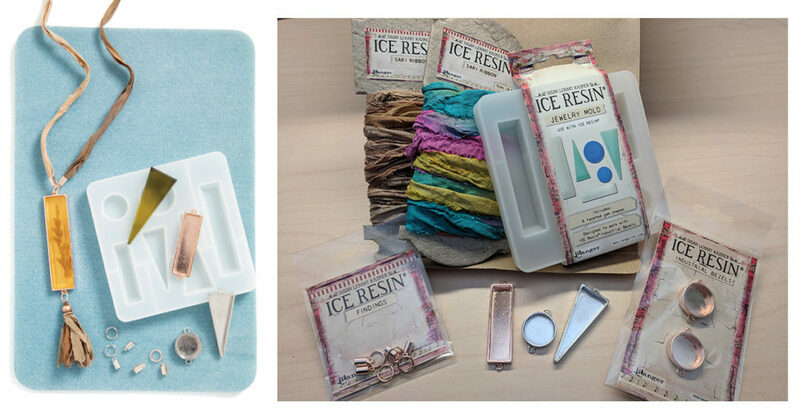 I used alcohol inks, but there are many ways to add color to your ICE Resin. There are some products designed specifically for ICE Resin that give great results. I’m looking forward to working with the ICE Resin Tints and Lusters. #HandmadeBracelets eBook Get a sneak peak into the ICE Resin® Creative Team’s time among the stars as you admire their Hollywood-inspired mixed-media jewelry. 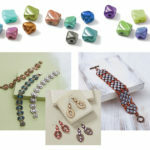 You’ll also find jewelry projects for several of the handmade bracelets created for Hollywood’s finest. Exploring Resin Jewelry-Making with Susan Lenart Kazmer Video Download – Create designs with Susan Lenart Kazmer and learn new techniques for working with resin. Resin Alchemy eBook by Susan Lenart Kazmer – Join resin authority Susan Lenart Kazmer as she covers the basics and goes beyond with this comprehensive jewelry making eBook. Get ready to add beautiful textures, colors, mixed media elements and more to your resin jewelry with this ultimate eBook. I went into this experiment with almost no knowledge about epoxy resin products. But I came out the other side with some really cool pieces. I’m totally inspired to keep playing with ICE Resin, and have some really big projects rolling around in my noggin.